Following in the footsteps of funnymen turned serious actors such as Robin Williams, Jim Carrey and most recently Will Ferrell, Adam Sandler follows up his fine dramatic work in Punch Drunk Love and Spanglish with writer/director Mike Binder’s best film since The Upside of Anger. Sticking to the themes of grief, anger and post-traumatic stress that he explored in Upside, Binder turns his attentions to the atrocious aftermath for the families who lost loved ones in the attacks of September 11, 2001. Binder’s small film provides a disturbingly accurate illustration that serves as a reminder that we may never fully grasp just how many lives will be affected down the road from the horrible events, as there were many more casualties than the ones seen on the news. Don Cheadle is completely convincing as a likable dentist who, although successful in his practice, has become a bit passive in his dealings with others, pushed around by his colleagues in his private practice, cornered by a female patient who propositions him and then keeps returning and smothered at home by his beautiful and well-intentioned wife (Jada Pinkett-Smith) and daughters. One day, he sees a familiar looking man zipping around New York City on a scooter and realizes it’s his long lost dental college roommate, Adam Sandler. 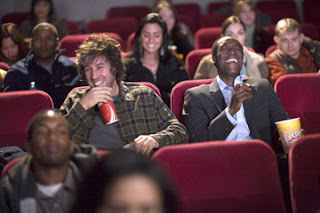 When he finally connects with Sandler after a few failed attempts, he realizes that Sandler has absolutely no memory of Cheadle or much of anything else as the audience learns that he is in the throes of severe post-traumatic stress following the deaths of his wife and three young daughters whose Boston flight crashed into one of the twin towers. Not content to simply let his friend Charlie live in his own delusional world oblivious to others, and in desperate need of some male companionship of his own, Cheadle reaches out to his former friend and the two begin to find solace, comfort and a road back to their own lives through shared anger, video games, old records, Mel Brooks movies, Chinese food, and ultimately in simply being there for one another. Binder’s ambitiously understated film succeeds mostly because of the charismatic performances by the leads (including Liv Tyler in a small but vital role as a caring therapist who admirably conveys sweetness and knowledge with very little dialogue) and while some moments are a bit contrived and uneven, it’s still quite a worthwhile movie because it taps right in to our American psyche and sense of loss, betrayal, national anxiety and period of uncertainty that we all faced on that particularly monstrous day. Note: Binder fills the film with the sounds of music that heals Sandler’s Charlie including classics by The Who, The Pretenders, and Bruce Springsteen but Pearl Jam’s reworking of the title track (by The Who) made exclusively for the film is a haunting masterpiece. Download it now.